Methi Matar Malai is a rich creamy dish made with fresh fenugreek leaves, green peas, cream and spices. Punjabi Creamy Fenugreek Leaves Peas Curry is a popular North Indian dish where Methi (Fenugreek leaves) and Matar (Peas) are simmered in smooth onion-whole spices gravy and topped with Malai (cream). Fenugreek slows absorption of sugars and stimulates insulin, both of which help lower blood sugar in levels in people with diabetes. Fenugreek is also used as a remedy for digestive problems. 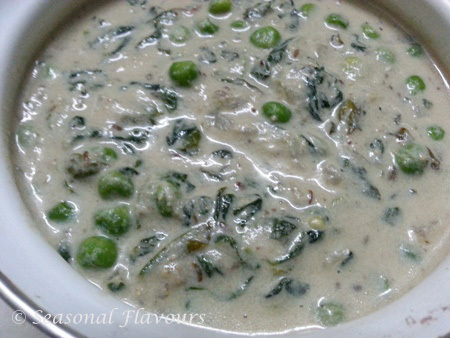 Methi Matar Malai white gravy recipe is a delightful combination of fenugreek leaves and peas simmered in a creamy spiced mixture. A rich, aromatic and flavourful dish, Punjabi Methi Malai Matar pairs well with Naan or Pulao. 1. To make Matar Methi Malai, pick the methi leaves and wash well. You can either chop the leaves finely or use whole. 2. Soak the cashew nuts and poppy seeds in bowl of warm water for about 10-15 minutes. Strain and set aside. 3. Boil the green peas until tender, drain and set aside. 4. Cut the onion into quarters and boil it till it turns soft. Remove with a slotted spoon, cool and grind to a smooth paste along with cloves, cinnamon, cardamom, green chilli, poppy seeds and cashew nuts. Keep aside. 5. Heat oil in a pan. Sizzle cumin seeds and then add chopped onions. Saute till they become slightly brown. Tip in the ginger-garlic paste and fry for 1-2 minutes. 6. Add the fenugreek leaves and fry for a couple of minutes. 7. Mix in the ground onion-spice paste. Simmer on medium heat for 2-3 minutes. 8. Add the boiled green peas, a cup of fresh milk, salt, sugar and 1-2 tbsp of water. Mix well and cook till you get a smooth creamy consistency. 9. Stir in a blob of fresh cream and combine Matar Methi Malai well. 10. Remove and serve Methi Matar Malai Punjabi Style with Rotis or Naan. If you are looking for more green peas recipes, do try out Vankaya Batani and Palak Peas. Punjabi Methi Mutter Malai in white gravy is a yummy and creamy vegetarian recipe, perfect to have with Naan or Rotis. Learn how to make this easy and deliciously Creamy Fenugreek Leaves Peas Curry. Wash and pick fenugreek leaves. Soak cashew nuts and poppy seeds in warm water for 10-15 minutes. Drain and keep aside. Quarter and boil the onion listed under grinding till its colour changes. Remove and grind to a fine paste along with cinnamon, cardamom, cloves, green chilli, cashew nuts and poppy seeds. Heat oil in a pan. Add cumin seeds and once they start to crackle add finely chopped onions and fry for 1-2 minutes till they become pink. Add ginger-garlic paste and fry for a couple of minutes till the raw smell disappears. Add fenugreek leaves and sauté for 2- 3 minutes. Tip in the ground paste, mix well and cook till the raw smell disappears. Add the green peas, milk, salt, sugar and about 1-2 tbsp of water and simmer on a medium flame till a saucy consistency is reached. Add fresh cream, combine well and remove. Serve Methi Matar Malai with Rotis or Naan.